Oil prices are recovering and should continue to rise. Ring Energy should continue to rise with oil prices and their 50% growth rate. Ring Energy, Inc., an exploration and production company, acquires, explores for, develops, and produces oil and natural gas in Texas, the United States. As of December 31, 2017, the company's proved reserves consisted of approximately 31.9 million barrel of oil equivalent. As of the above date, it also had interests in 8,102 net developed acres and 61,772 net undeveloped acres in Andrews and Gaines counties; and 10,235 net developed acres and 9,682 net undeveloped acres in Culberson and Reeves counties. It primarily sells its oil and natural gas production to end users, marketers, and other purchasers. The company was formerly known as Transglobal Mining Corp. and changed its name to Ring Energy, Inc. in March 2008. Ring Energy, Inc. was founded in 2004 and is headquartered in Midland, Texas. Company description from FinViz.com. Ring is an up and coming shale oil producer. With oil prices down so sharply over the last three months, Ring shares were knocked back to $4 after trading above $16 in May. 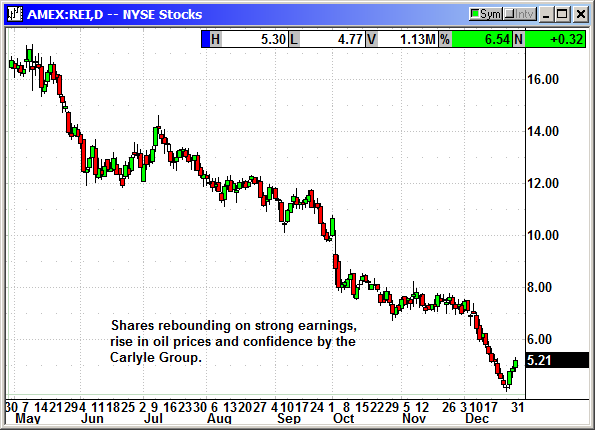 The decline in crude prices is about over. The current $45 level is not economic for many producers and a major pain level for the OPEC nations. They are rapidly cutting production to lift prices higher. This will lift all the US energy stocks as well. Their Q3 earnings were 14 cents beating estimates for 11 cents. Revenues of $32.7 million rose from $16.4 million in the year ago quarter. Revenues for the first 9 months of 2018 rose from $43.4 million to $92.5 million. Production rose from 346,900 barrels to 555,020 barrels, a 59.9% increase. Gas volumes increased 39.2% to 280,200 Mcf. On a Boe basis production rose 58.1% from 380,426 to 601,720 Boe. They closed an acquisition of 4,763 net acres in Andrews County Texas on December 26th that gave them 55 new horizontal drilling locations. The leases are adjacent to Ring's currently operated properties. The seller was Tessara Petroleum, a wholly owned subsidiary of the Carlyle Group. The Carlyle Group took payment in stock saying, "We have chosen to receive consideration in the form of stock as we believe Ring is a best-in-class operator and the assets being transferred are synergistic with Ring's existing properties that lie just across the lease line. We are fortunate to have found a partner that we admire and trust and look forward to seeing Ring increase its scale and value over time." The Carlyle Group are smart people. If they believe Ring is going to appreciate, it is likely to happen. Ring's production is growing rapidly and with oil prices rebounding the stock should continue rising as well.